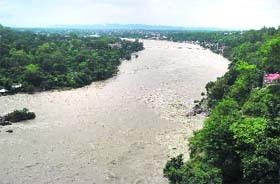 Endorsing the view of experts, the Centre and �most state governments� that the ambitious project to link rivers in India was in �national interest,� the Supreme Court today directed the Centre to constitute a committee headed by the Water Resources Minister for planning and implementing it. Sam Pitroda, Adviser to the Prime Minister, and his panel has not painted a very rosy picture for the country�s lifeline, the Railways. After the Anil Kakodkar committee report on safety which sought Rs one lakh crore for upgrading rail facilities, the Pitroda panel on railway modernisation has said the organisation needs Rs 8.23 lakh crore over the next five years to give it a complete makeover. 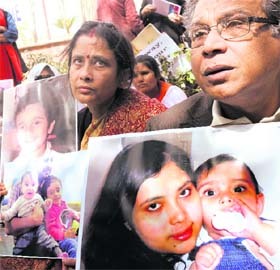 External Affairs Minister SM Krishna rushed his special envoy to Norway even as the grandparents of two Indian children, lodged in a foster home in the Scandinavian nation, sat on a �dharna� here today demanding the early return of the two kids to India. The Supreme Court today ruled that mining of small minerals in Haryana and Rajasthan even in areas measuring less than five hectares could be allowed only after environmental clearance from the Union Ministry of Forests and Environment (MoEF). Defence Minister AK Antony today reacted sharply to China�s �objections� to his visit to Arunachal Pradesh last week. �Statements made by China are objectionable. In the remote Kailashnagar village (Jalore district), on the border of Rajasthan and Gujarat, lives Parbhu Ram, a farmer who has never been to either Punjab or Haryana. 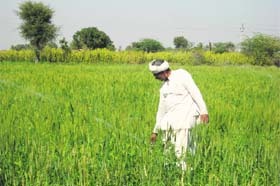 But Parbhu knows about the grievous damage to once-fertile soils of India�s grain bowl � all due to years of overuse of chemical fertilsers and water. 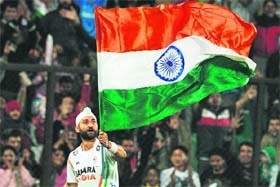 Sandeep Singh can bring a dead match alive when he takes his position to slam a penalty corner. His drag-flicks have become a virtual patent and a sure shot to success, something fans eagerly look forward to.